thyme thujanol essential oil (1 ml) + (10 drops) + Winter Savory essential oil (organic) (1 ml) . Prepare the mixture in a 5 ml vial. Shake well. Put 1 drop of this preparation on a tablespoon of honey. thyme thujanol essential oil (20 drops) + Helichrysum essential oil (organic) (12 drops) + mediterranean cypress essential oil (organic) (12 drops) + Mastic essential oil (organic) (12 drops) + Calophyllum Oil (organic) (2 ml) . Make this mixture into a 10 ml vial. Apply 3 drops of this mixture on the areas to heal 3 times a day until improvement. thyme thujanol essential oil (2 drops) + Tea-tree essential oil (organic) (2 drops) + Geranium bourbon essential oil (organic) (2 drops) + Bay Laurel essential oil (organic) (2 drops) + Aspic Lavender essential oil (organic) (2 drops) + Palmarosa essential oil (organic) (2 drops) + Sweet almond oil (organic) (10 drops) . Mix in a bottle all these components and apply 3x/day until the fungus disappears. thyme thujanol essential oil (2 drops) + Winter Savory essential oil (organic) (2 drops) + Tarragon essential oil (2 drops) + Sandalwood essential oil (2 drops) . Massage the lower abdomen every morning, noon and night for several days. thyme thujanol essential oil (2 drops) + (2 drops) + Clove Bud essential oil (organic) (2 drops) + Winter Savory essential oil (organic) (2 drops) + Basil exotic essential oil (organic) (2 drops) + Baobab Oil (organic) (10 drops) . Massage the lower back as well as the lower abdomen 3x/day with a few drops of this mixture. thyme thujanol essential oil (0.5 ml) + mediterranean cypress essential oil (organic) (0.5 ml) + Tea-tree essential oil (organic) (0.5 ml) + Eucalyptus radiata essential oil (organic) (0.5 ml) . Prepare a mixture with these 4 essential oils. Apply 2-3 drops of this mixture previously diluted in some aloe vera gel or neutral cream base (Creme Elementaire) 2-4 times per day onto the chest. thyme thujanol essential oil (1 drop) + Peppermint essential oil (organic) (1 drop) + Winter Savory essential oil (organic) (1 drop) + Niaouli essential oil (organic) (1 drop) + Pumpkin Seed oil (organic) (5 drops) . Mix the essential oils, the vegetable oil and a pinch of salt. Gargle and spit out. 3x/day. 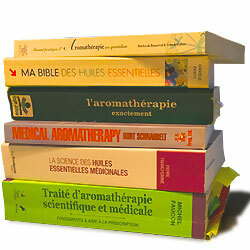 thyme thujanol essential oil (1 drop) + Niaouli essential oil (organic) (1 drop) + Solub-HE (4 drops) . Prepare a mixture with these 4 essential oils. Apply 2-3 drops of this mixture previously diluted in some aloe vera gel or neutral cream base (Creme Elementaire) 2-4 times per day onto the chest. thyme thujanol essential oil (0.5 ml) + Tea-tree essential oil (organic) (0.5 ml) + Niaouli essential oil (organic) (0.5 ml) + Bay Laurel essential oil (organic) (0.5 ml) + Calendula macerate (organic) (5 ml) . Prepare a lotion with these essential oils and the calendula maceration. Gently massage the throat with a few drops of the mixture 3 to 4 times a day for 3 days. thyme thujanol essential oil (3 drops) + Eucalyptus radiata essential oil (organic) (3 drops) + Niaouli essential oil (organic) (3 drops) + Ravintsara essential oil (organic) (3 drops) + Lavender essential oil (organic) (3 drops) . Diffuse 5 minutes per hour, every hour. You can also directly inhale from the bottle 3x/day. 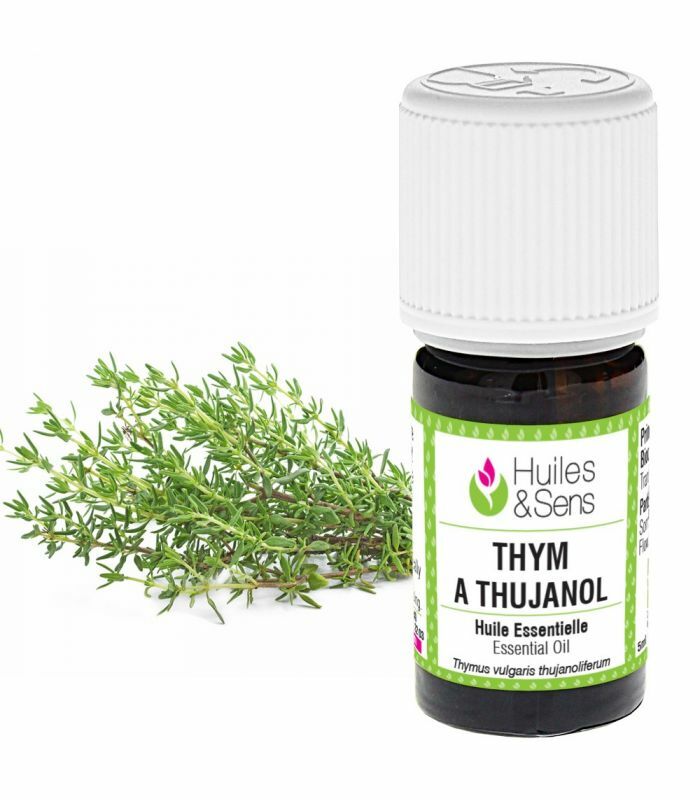 thyme thujanol essential oil (1 ml) + Cistus essential oil (organic) (1 ml) + Niaouli essential oil (organic) (1 ml) + Tea-tree essential oil (organic) (1 ml) + Helichrysum essential oil (organic) (0.5 ml) + Myrtle essential oil (organic) (1 ml) + Rosehip Oil (organic) (50 ml) . This mixture is suitable for after delivery. Massage affected areas with a few drops morning and evening until improvement. thyme thujanol essential oil (1 ml) + Tea-tree essential oil (organic) (1 ml) + Rosewood essential oil (organic) (1 ml) + Jojoba Oil (organic) (50 ml) . With 3 drops of this mixture, massage painful areas of the throat. Repeat 3 to 4 times a day. thyme thujanol essential oil (1 ml) + mediterranean cypress essential oil (organic) (1 ml) + Tarragon essential oil (1 ml) + Sweet almond oil (organic) (20 ml) . Mix these ingredients in a drop dispensing bottle of 30 ml amber glass. Apply 2 to 3 drops of the preparation to the solar plexus and the sole of the feet twice a day until improvement. thyme thujanol essential oil (3 drops) + Basil exotic essential oil (organic) (3 drops) + Ledum essential oil (organic) (3 drops) . Mix for 3 massages, one in the morning, one at noon and one at bedtime. Massage the area of the liver with this preparation.